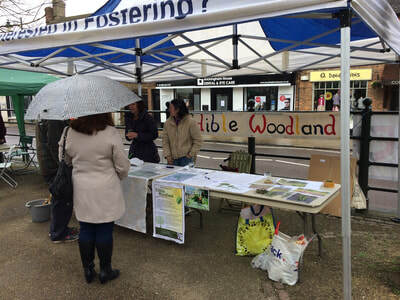 The spring fair is a great way to talk to people about the edible Woodland, and to raise money. Shirley and Esther were there helping out and we talked to people about the project, collected emails, and sold some things. Ingrid had prepared some horseradish roots and instructions on how to prepare ground horseradish. It is interesting to see how many people were initially reluctant. But lots of roots were given out. Our daughter Lisa had prepared lots of succulent plants to sell. And we sold almost all of them. As well as two shovels. We collected £40 in total! So thanks to everyone who contributed. Elizabeth came along after the event and donated some Walking Onions for the EW. Thanks Elisabeth. 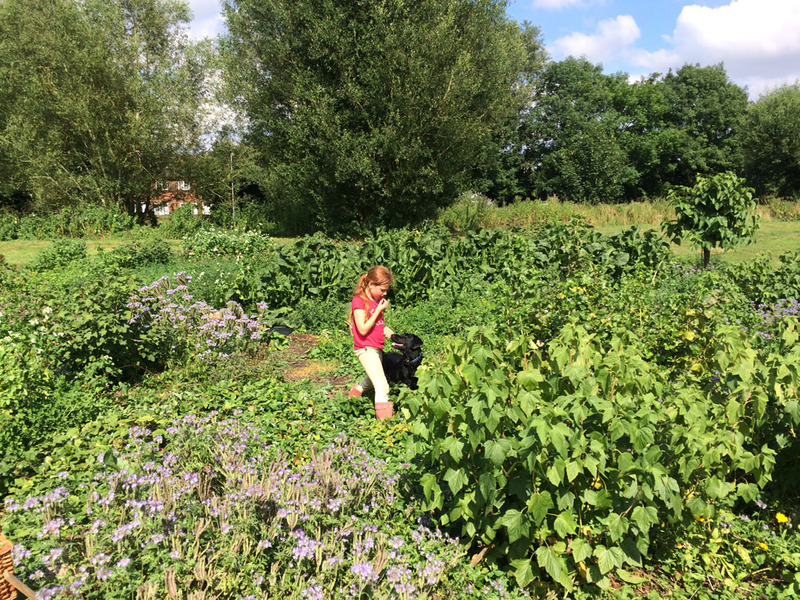 And lastly, we met Kirsty Forshaw, who is working with a group in MK, starting up a forest garden! So we had a good chat and agreed that there is much to learn from each other. We will hopefully be arranging exchange visits and sharing of ideas. In January 2018 we had an evening meeting to try and decide some things we wanted to do this year. It was a good turnout - Sarah, Esther, Ingrid, John, Alan, and Shirley. It was good to see people and sorry some had to miss it. Event - an event at the EW for both children activities and something for adults. We can organise several small different things to do. Esther also talked about willow sculptures and benches. We looked at some pictures of willow sculptures from an artist that Esther had come across. The benches can be made form logs - cut in the right way. Benches - we need to get hold of large logs and somehow get them to the EW. If anyone has ideas, or knows of a tree surgeon who can unload the logs at the EW. Willow sculptures - invite an artist to come and make sculptures. Esther also talked about making small seating for children to gather around. Ingrid talked about the plant signs, and brought some white wall tiles. We thought that maybe we could write on the times and use them as signs at the EW. So, Sarah took the tiles away to write on some text and test its resilience in the outdoors. Shirley mentioned that Martin Crawfords food book is in Buckingham library - a book created from his experience with his forest garden. We talked about having the spring workday at the EW on Feb the 25th, or the 4th of March. John - Ask Lee (own council) about getting logs to the EW. John - Ask lee about the mulch to be delivered. John - to test log splitting ing the wedge. Everyone - to try and source wood logs. Esther - set date for the adult and children event. Alan - put a poster in each of the park notice boards. Shirley - put a poster in the community centre notice board. John - take a poster to the garden centre. Anyone - find out how to drill holes in tiles. Ingrid - find out about the mushrooms. Any follow up can be posted in the discussion section, where you can register and use the forum here. Thats all green manure, growing really well. 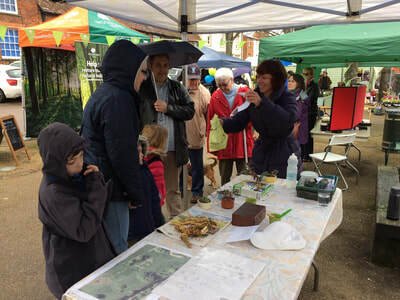 April 19 2015 - Thanks to all those who came to find out what we do at the Buckingham Spring Fair. 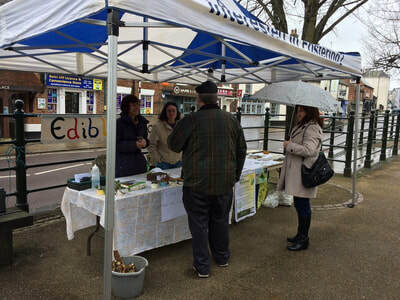 The rain held off and there was a great turnout. Well done to John and Ingrid for decking out the stand and grating all that horseradish - the site's very first crop!!!!! Can you believe it, seedlings are now appearing! it shows what the warm weather is doing to the speed of growth. Everything we put down seems to be doing well, except for the fact that it is so dry. If anyone is going to the EW soon, can you please keep a lookout for things drying out. Ingrid and I watered some of the plants today, we did some weeding, and built up the tumps around the trees. At this time of the year we thought our biggest problem would be flooding! The trees are all sprouting leaves, and it looks so good. They have all come up this year, showing that the care we took last year is paying off. The tadpoles that were doing so well are struggling. The water level of the pond has dropped so much, that there is little water for them to swim in. 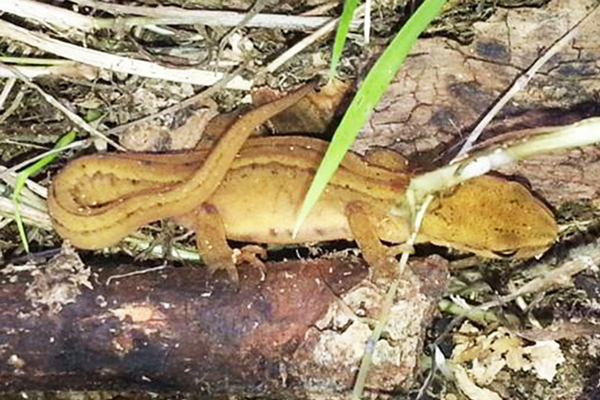 Today, I had to free them for being trapped in a restricted part of the pond. 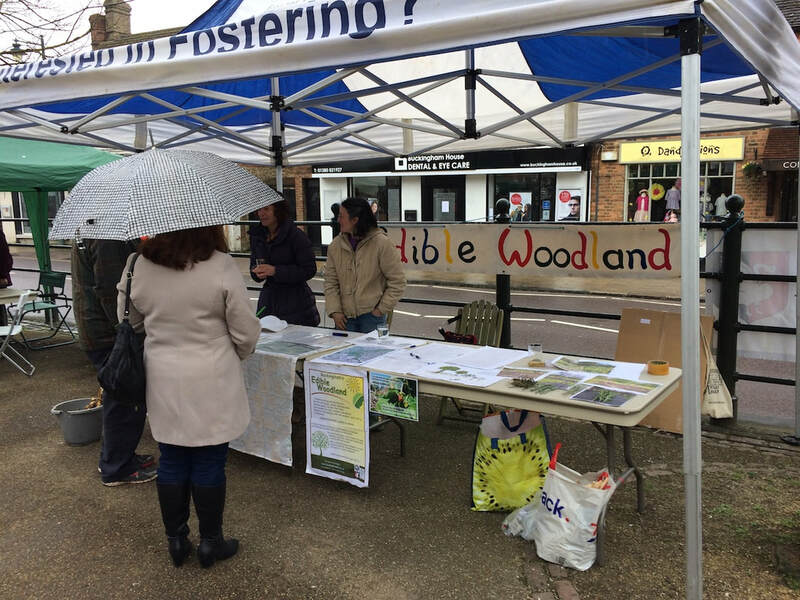 Mita, from the West Street shop, has said that she and her daughters would like to put her artistic efforts towards the edible woodland. So she has taken some willow, to see if something can be created from them. If anyone has any art related ideas, please get into contact with Mita. On a different note, the shop Mita runs West Street shop and takes orders for locally made artisan bread. So if you are interested, go in there and place an order, its really great bread. Steven is going abroad for quite a while. 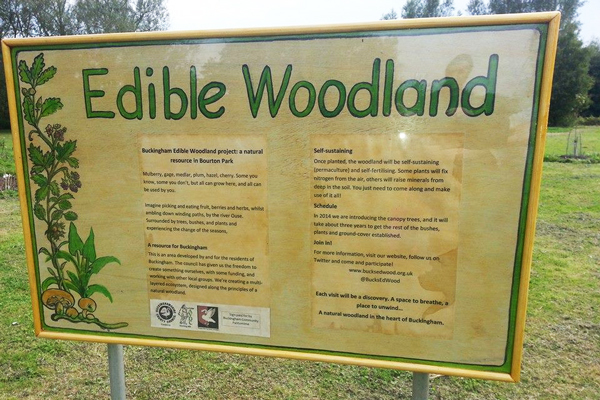 So if anyone would like to take over the tweet account for the edible woodland, that would be great. Please let me know if you could do that. 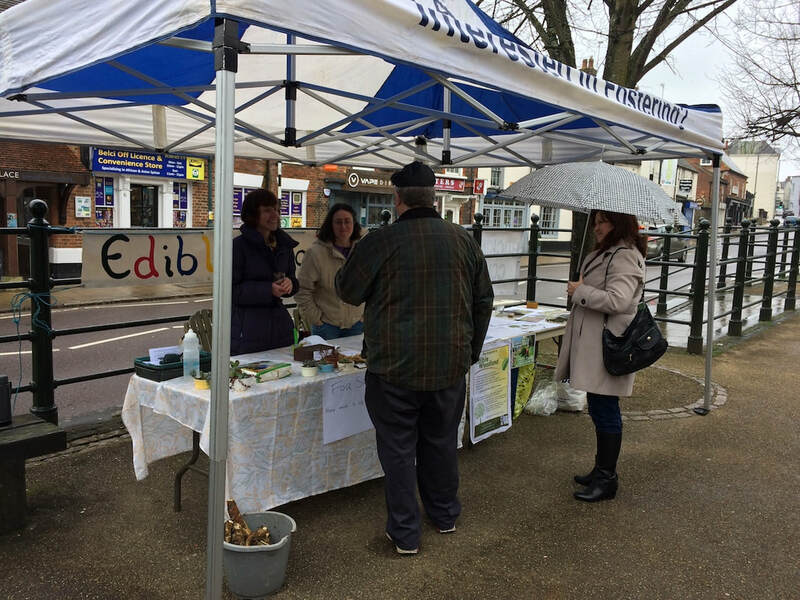 Could anyone who could contribute to being at our stall for the spring fair, 19th 10 - 2pm, please let me know, so that we can coordinate. At the moment its Ingrid and I. Anytime you can spend helping would be great, giving us a bit of a break. Maria is going to drop off the gazebo sometime before the event. Steven has offered to print off posters and leaflets. A small group of duke of edinburgh teenagers has contacted me for possible involving themselves in the ew for a project. As soon as I have any details I will post them on the website, and I will pass everythg onto Maria. If anyone would like to help please contact me and I can pass you on to whoever will be involved. Wet, windy and great fun! 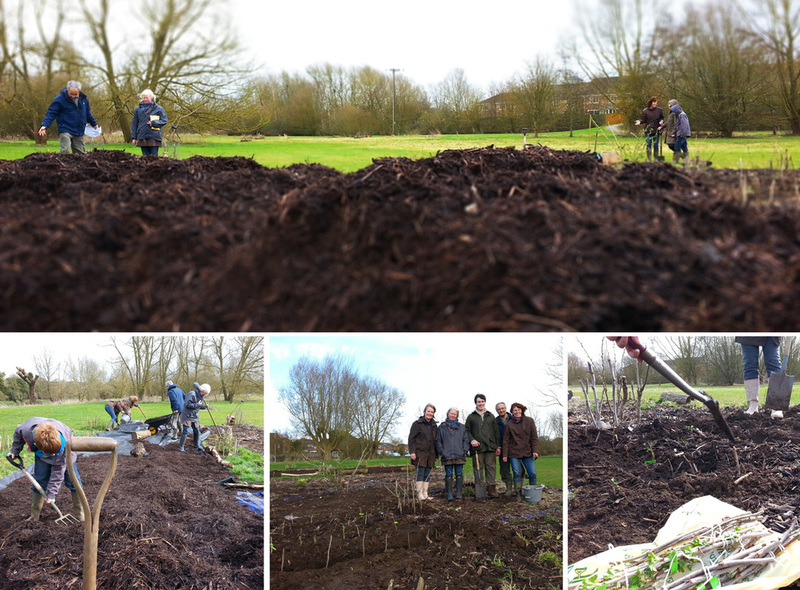 The #BigPlantingEvent took place on Sunday, under the watchful eye of Claire White, permaculture expert. 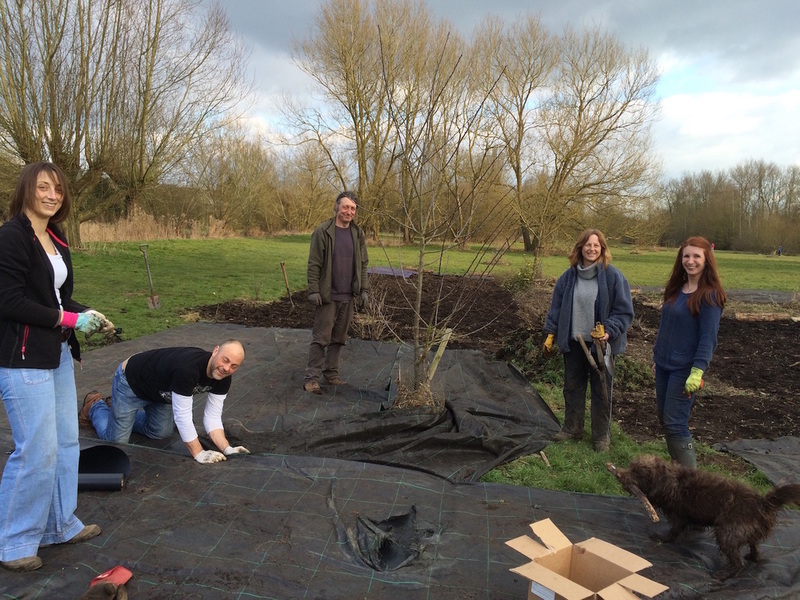 We planted out lupins, comfrey, Creeping Nepalese raspberry(! 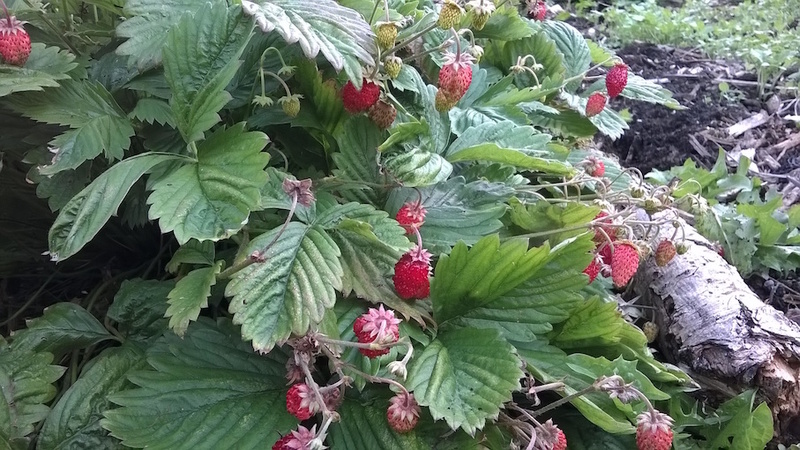 ), strawberries, a plum tree, clover, shepherdia (commonly called buffaloberries or bullberries) and lots of currants. We laid down a weed mat and dominated that compost/mulch mountain. We almost lost one of the gang into the river due to the high winds! Found one Sunday! Hopefully he/she will get along with the frog and hedgehog we know are also there! The new sign is up, gratefully donated by the Pantomime group, sign made by Steve, graphics by Ed's uncle, and varnishing by Steven.